Home News & Announcements What is a planar transformer? A planar transformer is essentially a transformer that uses flat windings, usually on a printed circuit board, instead of copper wire to form the coils. The PCB construction creates a different form factor that offers some unique advantages and a few tradeoffs. What are the advantages of planar transformers? Low profile – the windings are flat, allowing a shorter winding window. This can also mean the core can be designed for larger cross-sectional area and greater surface area on the top and bottom to facilitate removal of heat from the transformer. Excellent repeatability of construction – the PCB windings are very repeatable, which makes the parasitic effects such as leakage inductance and interwinding capacitance more predictable and repeatable. 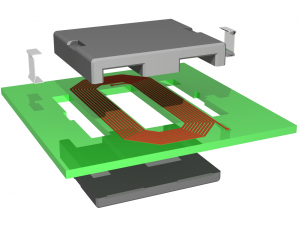 High isolation – The PCB construction allows increased insulation between winding layers. High-efficiency (typ 99% +), in a lightweight compact form. What are some of the tradeoffs of planar transformers? 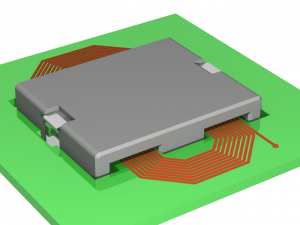 The PCB takes up more of the winding window, limiting the total number of turns that can fit on a particular package. For this reason, planar transformers are usually chosen for high frequency transformer applications (>100kHz) because as frequency increases, the number of turns on each winding generally decreases. Higher inter-winding capacitance: because the windings are flat PCB traces, the capacitance from one layer to the next can be higher than traditional transformers. Greater initial tooling investment is required to lay out all the windings on multiple PCB layers. Standard transformer package materials are readily available and custom versions can be wound easily. Planar transformers often require PCB setup charges, and so custom planar transformers are less common. What are some of the applications of planar transformers? Are planar transformers right for my application? The Engineers at CET Technology are expert at designing and manufacturing planar transformers as well as traditional switching transformers, both standard and custom designs. Call CET today to discuss your application!